this baking challenge is certainly going to get me to make recipes i never would have otherwise. i approached the recipe with extreme caution. i knew i could get behind the ingredients in the filling: prosciutto, ricotta, cheese, more cheese. but baked in a sweet pie crust? with a fancy-pants lattice top? i mean, julia and dorie, are you for real? 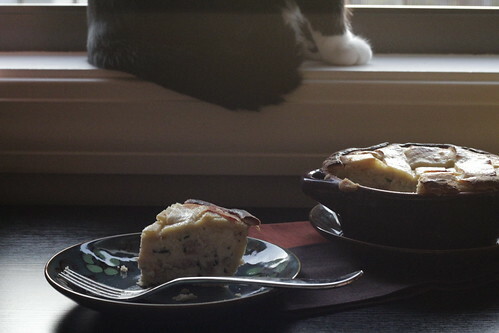 i cut the recipe in half and baked the pie on a sunday and waited (waited! me!) until tuesday when i would have friends over to help me judge and consume what i feared would be calorie-bomb without much of a payoff. this was a delicious recipe. i mean. ricotta. mozz. parm. prosciutto. done. and the salty filling contrasted really nicely with the sweet crust. 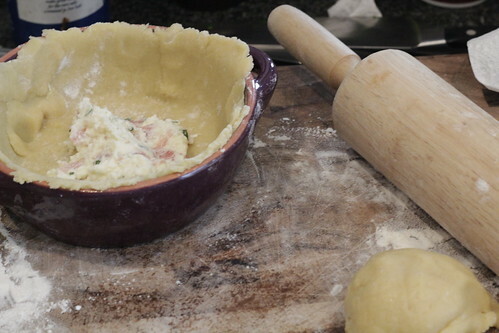 which – and we all know my fear of rolling pins – was easy to put together in the food processor, did not require time to chill, and was reasonably forgiving when it came to assembly. 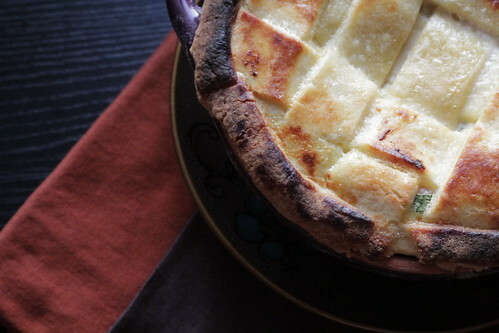 the recipe omits an egg wash for the crust, which i added when i reheated because who wants a pale pie? it ended up a little toasty around the edges and a little pale in the middle where the filling sunk during the first and second trip to the oven. 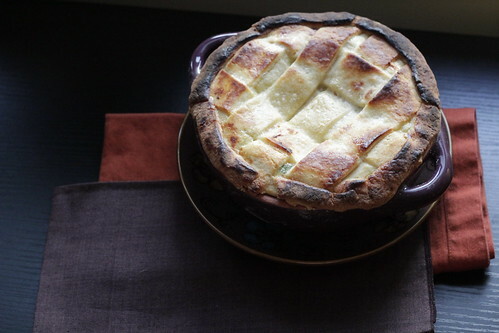 This entry was posted in Cheese, Dinner, Tarts and Pies, Tuesdays with Dorie and tagged Baking with Julia, cheese, pie crust, pizza rustica, ricotta, savory pie, savory tart, Tuesdays with Dorie by hilary924. Bookmark the permalink. It looks delicious! I love your pictures. it looks yummy, glad you tackled it and had success!! I find that TWD forces me out of my comfort zone and even if I don’t love the results, I’m glad I made the effort. Yours is beautiful. Glad this was a hit for you. I agree – projects like this definitely take me outside of my normal routine and have made me a more adventurous cook all around.